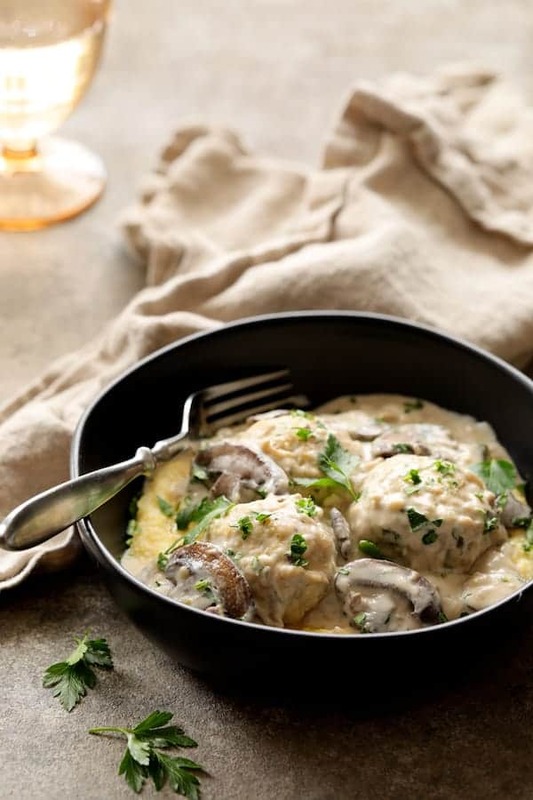 Chicken Meatballs Marsala with Baked Parmesan Polenta is a fun twist on classic Chicken Marsala. It’s comforting, delicious and is sure to bring a taste of Italy to your table! Chicken Marsala, made with marsala wine, is a classic dish you’ll find on menus in many Italian-American restaurants. Here’s a creative and fun spin on it! First of all, let me just say that photographing a white meat in a white sauce over creamy yellow-white polenta is a bit of a challenge. However, this dish was worth the challenge! Real Marsala wine is produced near Sicily. There are two types–dry or sweet. Marsala is a “fortified” wine which means additional alcohol (such as brandy) was added during the fermentation process. Adding the alcohol enables it to keep longer, however alcohol levels can be as high as 20%. You’ll want to purchase dry marsala for this dish; sweet marsala is best served with dessert. When I make meatballs, I like to get all the ingredients except the ground meat mixed together before adding the ground meat. This ensures all the ingredients—especially the seasonings—are evenly distributed. I wear disposable gloves and mix with my hands to get the job done faster and more thoroughly. 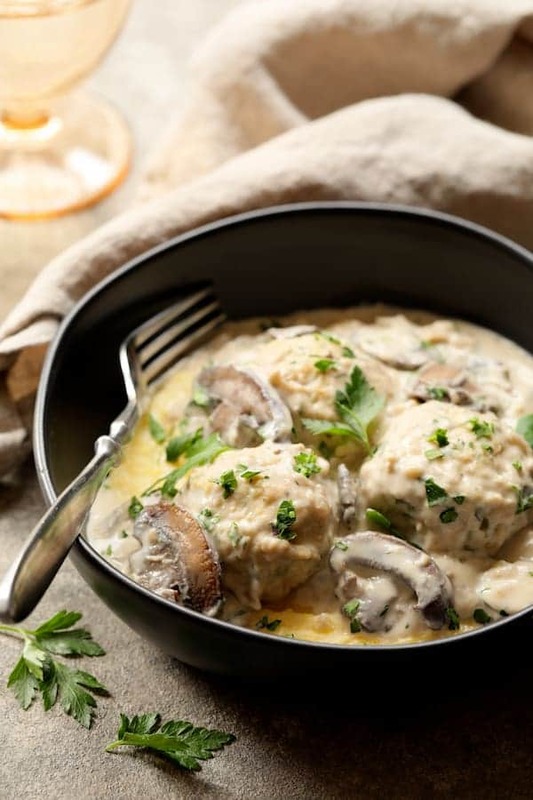 Make the Chicken Marsala Meatballs in any size you like. I chose to do jumbo meatballs here because it adds to the fun element. If doing smaller meatballs, the best way I’ve found to portion and form meatballs is with a 1-inch cookie dough scoop. Simply grab a handful of the meat mixture in one hand and the cookie dough scoop in the other. Use the heel of the hand holding the meat mixture to level off the scoop. Empty the scoop onto the baking sheet then go back and form them into neat balls with your hands. Frying meatballs is messy and requires more attention so I prefer to bake them. The meatballs won’t have the color they would if fried, but this method is still so much easier. I place on a sheet pan and bake to the safe internal temperature of 165 degrees. Another element of this dish that won’t require a great deal of attention is the baked polenta. 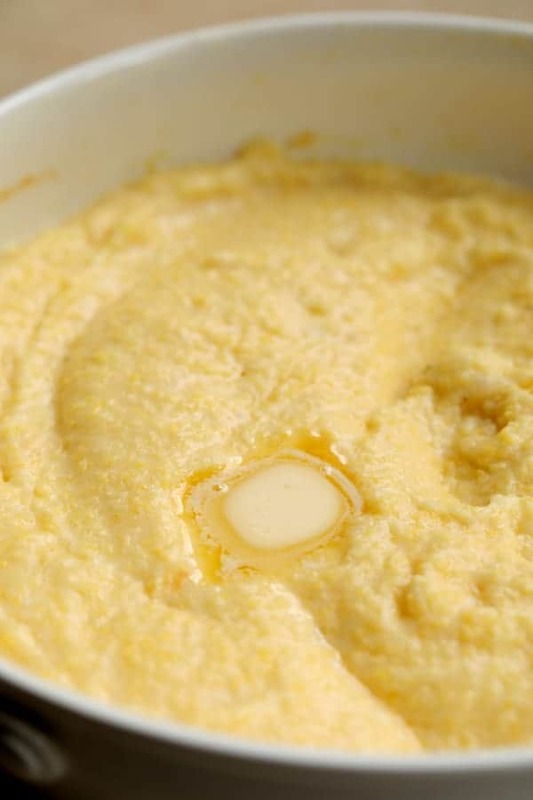 The traditional method for making polenta involves adding it slowly to boiling water or stock so that it doesn’t lump up, then stirring and watching it carefully so that it doesn’t burn. This process can take 30 minutes or more. Instead, get the liquid and polenta combined. Briefly microwave it to get it hot then place it in the oven to finish cooking. 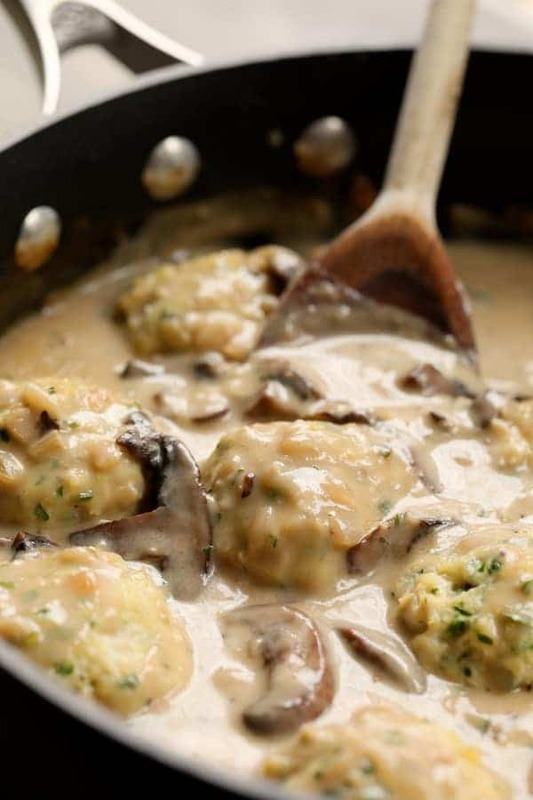 Bake the Chicken Marsala Meatballs at the same temperature as the polenta. You can do the meatballs ahead of time and then reheat them. However, polenta does not hold well and will begin to stiffen up as it sits. Chicken Meatballs Marsala with Baked Parmesan Polenta! POLENTA: Preheat oven to 350 degrees. Spray a 2-quart baking dish with cooking spray. Combine chicken broth, half-and-half, polenta and salt and black pepper to taste in the baking dish. Stir to combine. Microwave uncovered on high for 3 minutes. Stir again, cover and place in the oven. Bake 30-35 minutes or until all the liquid is absorbed. Stir in cheese and butter. Serve with meatballs. MEATBALLS AND SAUCE: Spray a non-stick baking sheet with cooking spray. Set aside. Heat oil and butter in a small sauté pan over medium-high heat. Add the onion, reduce heat to medium and cook 6-7 minutes or until onion is tender. Add garlic and cook 15 seconds or until fragrant. Transfer half of the onions to a mixing bowl and take remaining onions in the pan off the heat temporarily. Let onions in bowl cool 5 minutes before adding other ingredients. To mixing bowl with onions, add half the parsley, 2 tablespoons marsala, milk, panko, egg, salt, black pepper and mix well. Add ground chicken and mix well again. Form chicken mixture into 12 large meatballs and place on prepared baking sheet. Bake 20 minutes or until a meat thermometer inserted into the center registers at least 165 degrees. SAUCE: While meatballs are baking, add the butter to pan with remaining onion-garlic combination and bring back up to medium-high temperature. 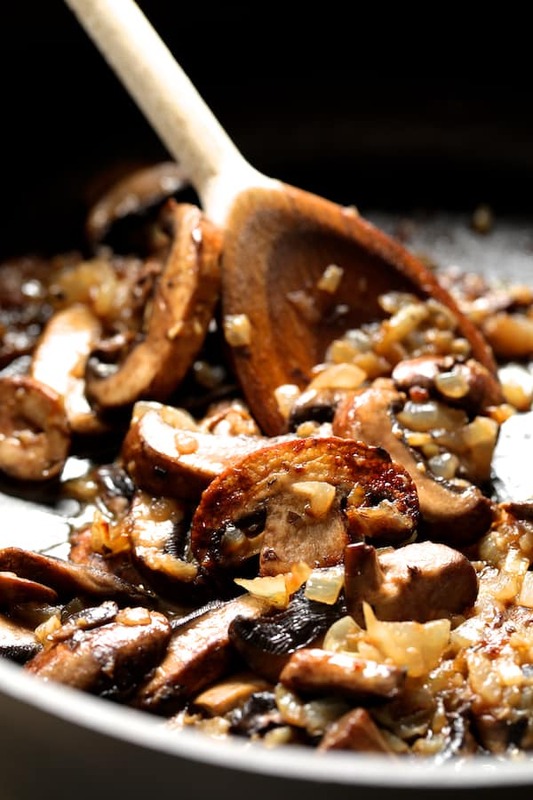 Add the mushrooms then reduce heat to medium and cook 5-6 minutes or until mushrooms are brown and tender. Add marsala, whisking constantly for 1 minute. Slowly add chicken broth, Worcestershire and heavy cream. Bring back to a boil then reduce heat to medium-low and simmer 5-10 minutes or until thickened. Transfer meatballs back to the pan and heat through. Add parsley, salt and black pepper to taste. Serve over meatballs with polenta. Garnish with additional parsley. Hi, Albert, Thanks so much! 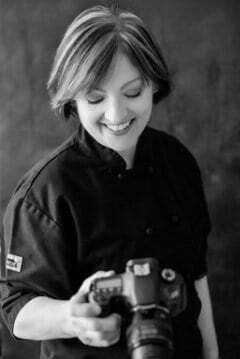 Yes, I was surprised to be in FoodGawker’s #1 spot! This was definitely a tough one to photograph!